Mamee has once again added its own touch to a Malaysian favourite. this time with the new Mamee Chef Lontong, its latest co-creation with Dato’ Chef Ismail. Together, they bring to life the traditional flavour of this popular Malaysian dish in a convenient way without comprising on taste and quality, and with the unique addition of Mamee Chef’s noodle cake. Mamee Chef Lontong was developed and perfected by Dato’ Chef Ismail over approximately 8 to 12 months and contains a blend of 8 widely-used spices and ingredients, including turmeric (kunyit), dry ginger, galangal (lengkuas), lemongrass (serai), key lime (limau nipis), candlenut (buah keras) and shrimp paste (belacan) powder. It also contains crustaceans for that added flavour. The highlight of this dish is of course the special lontong paste created by Dato’ Chef Ismail himself to give this dish a distinctive taste. 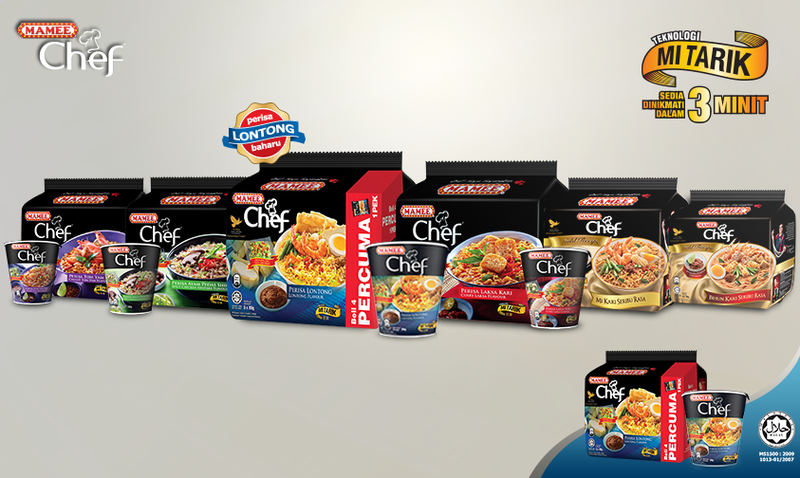 Each pack of Mamee Chef Lontong also comes with additional condiments such as chilies and vegetables for a more authentic experience. There are various regional styles of preparing lontong,but for many Malaysians, eating lontong means having the compressed rice chunks dunked in a rich and flavour some coconut-based soup. Mamee Chef is one of the first instant noodles in Malaysia to use the La Mian production technology. The La Mian method, also known as the pulled noodles technique, originated from China during the 15th century and creates noodles that stay springy for longer and don’t get soggy easily. Mamee has perfected the texture and taste of the noodle cake, as well as invested in machines to ensure that the pulled noodles for the Mamee Chef range are produced efficiently without compromising on quality. In Malaysia, Mamee has halalan toyibban certification from JAKIM for adhering to the industry best practices in maintaining the highest standards of quality and hygiene in food production.